Chicago artist Jim Bachor installs a tile mosaic in a pothole at the corner of Winder and Orleans St.
Over a hundred murals decorate the buildings in and around Detroit's Eastern Market. 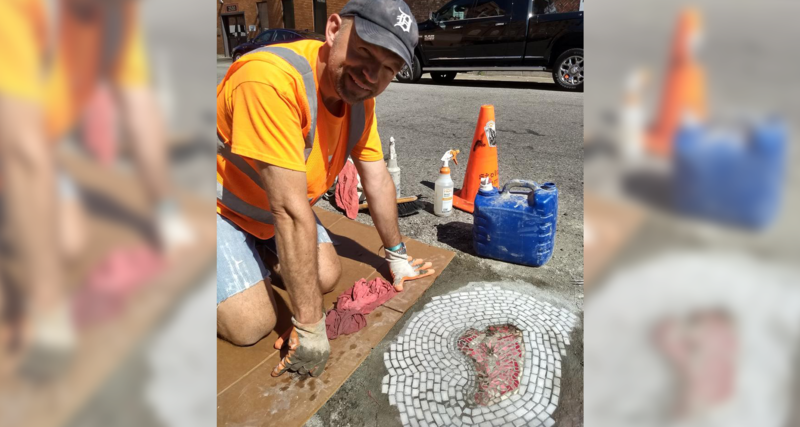 This year, as part of the Murals in the Market event, artist Jim Bachor is installing ten authentic tile mosaics in potholes around the market. His first piece at the corner of Winder and Orleans is an image of a steak. “This is a steak. I'm doing ten pieces. About six of them are specific to the area. So they'll be subject matter of things that people tend to come here to purchase,” says Bachor. Bachor creates his mosaics using the same tools and techniques as the craftsmen of the ancient world. 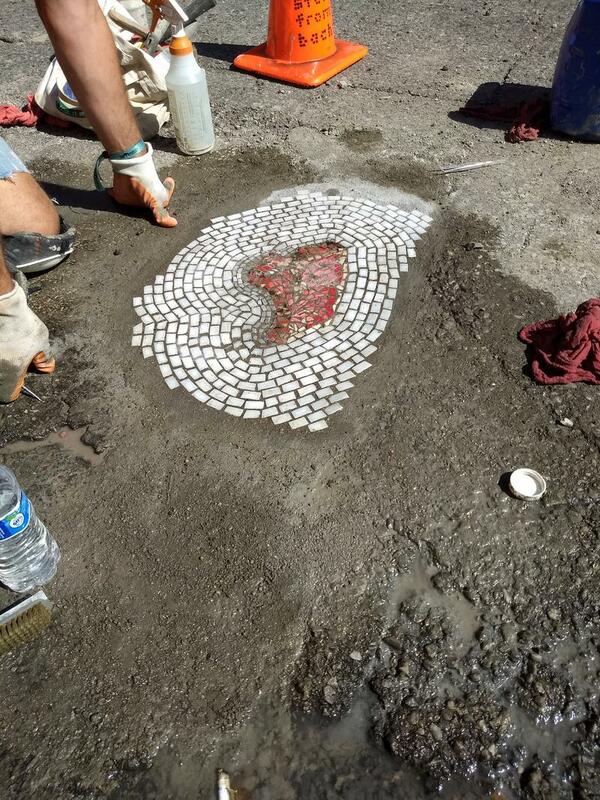 The mosaics are put together ahead of time in his studio and is then installed in the street in two stages. On his website, Bachor writes that he has always been fascinated by ancient history and was inspired to begin working in mosaics after volunteering with an archeological dig in Pompeii. 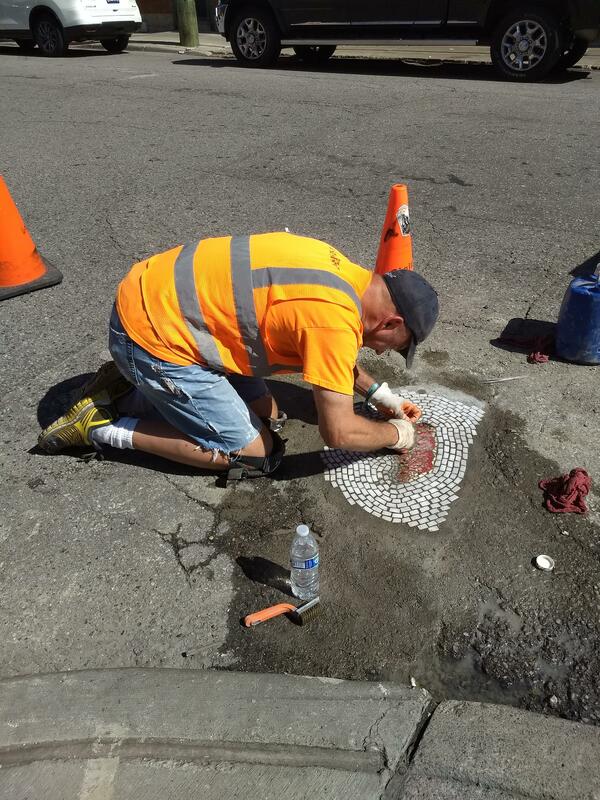 He's installed more than seventy mosaics in potholes around the world. Bachor says the art itself is very permanent, but that the asphalt surrounding the art can fail, and some mosaics have been lost when a street was re-paved. “If the asphalt is stable, these things will last indefinitely,” says Bachor.